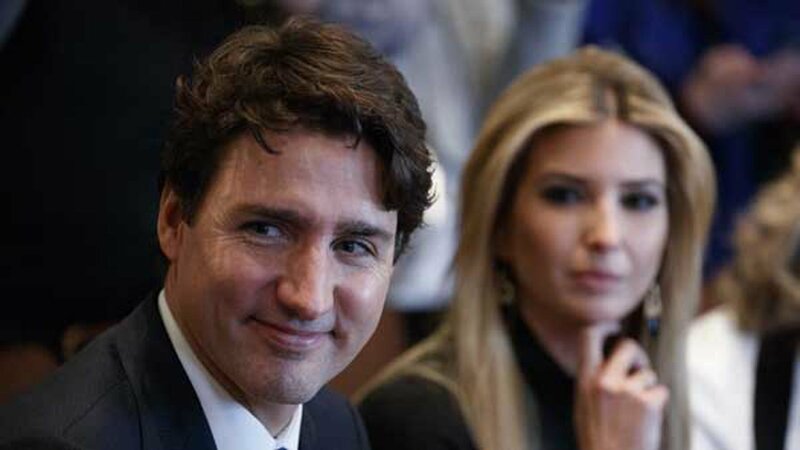 NEW YORK -- At a Broadway show about welcoming people during a time of need, Canadian Prime Minister Justin Trudeau hosted Ivanka Trump as his guest of honor. The first daughter sat in the audience Wednesday night alongside US Ambassador to the United Nations Nikki Haley. The show, "Come From Away," is a musical about the generosity of a remote Canadian town that welcomed 6,579 airline passengers who ended up stranded in Newfoundland after the September 11, 2001 terror attacks. "This story really shows that even in those darkest moments, we can lean on each other," Trudeau told the CBC. "Being there for each other in times of difficulties is something Newfoundlanders get, and it's certainly something Canadians and Americans get." Trudeau also downplayed the notion of tensions between the US and Canada, given the two countries' diverging policies on refugees and immigrants. Dozens of people have recently fled to Canada from the US following President Donald Trump's executive orders banning refugees and travelers from certain countries. Though a federal judge Wednesday blocked the administration's second iteration of the ban, fears linger among citizens of those nations. Meanwhile, Canada has touted its acceptance of tens of thousands of refugees. "We're always going to have differences in approaches on certain issues," Trudeau told CNN partner CBC when asked about the countries' different policies on refugees and immigrants. "The fundamental hopes for the future and the responsibilities of keeping people safe and building a better future for our kids is something we can always agree on." Before the show, Ivanka Trump and Haley greeted Canadian officials. Asked if he and the President's daughter spoke, Trudeau said she enjoyed the show, "as did everyone in the theater." Trudeau before the show addressed the cast and audience, stressing the friendship between the US and Canada, the CBC reported.